All contents copyright © 1998 Brenna Lorenz, Megaera Lorenz, Malachi Pulte. All Rights Reserved. 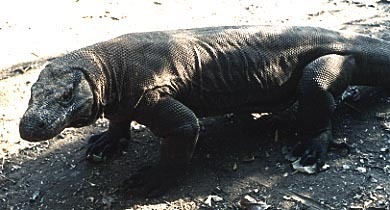 Komodo dragons are the world's largest lizards. They live on the islands of Komodo, Rinca and other tiny surrounding islands, and on the westernmost part of Flores Island in Indonesia. 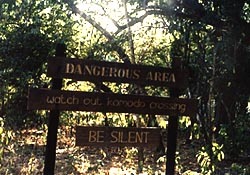 Komodo is west of Flores, east of Sumbawa, and north of Sumba. If you are an ordinary person, you can only reach Komodo by boat. If you are a wealthy celebrity, you might be able to get permission to fly there in a helicopter and use the helicopter pad that was constructed especially for President Suharto. Komodo and Rinca are odd islands. 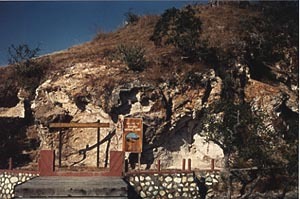 They are dry, hot, and relatively barren compared to the lush and jungly islands to the east and west of them in the Nusa Tenggara island chain. As you approach from a distance, you see Komodo as a low, hilly island. As you get closer, you can see the barren, rocky terrain of Komodo. Here is a close-up view of the dock at Rinca. 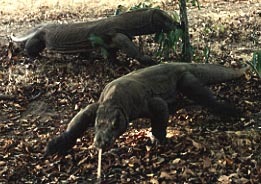 Both Komodo and Rinca belong to a National Park system designed to protect and preserve the endangered Komodo Dragon. These islands are composed of a silica-rich rock called rhyolite porphyry. The rhyolite contains large, perfect doubly terminated quartz crystals (lacking the prism faces), some of which are up to a centimeter long. The rhyolite is also rich in magnetite, which weathers out of the rock to form magnetite-rich sand on some of the beaches. In places, silica-rich groundwater has replaced the bedrock with chert. On Rinca, one can see fragments of worked chert lying around near the outcrops. These rocks are geologically distinct from the rocks found on islands to the east and west, which are more mafic in character. Check out Crocodile Hunter: Steve's Most Dangerous Adventure, a video documenting Steve Irwin's encounter with Komodo dragons and other reptiles. 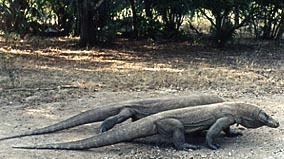 If you want to see the big Komodo dragons, you should get to the park early, before 6:00 a.m. when the first tour starts. Even this early, the island is hot. You should dress lightly, and bring a lot of water. Before the tour starts, you can visit the little museum they have at park headquarters, where you can see an exhibit of the various rock types found on the island, and a display of all their poisonous snakes, of which there are a great many. You can also pet the many deer that hang out at park headquarters. The big dragons don't come into the park headquarters area, so the deer are safe there. You can also see a lot of the little Komodo dragons, the young ones, who must spend their first several years in trees to be safe from their elders, who would gladly eat them. Komodo dragons are cannibals who eat their own young, and even other adults when they can pull it off. The tour is led by a couple of men from the park service. The men carry long, forked sticks, but say that their main protection from the dragons is the special rapport they have with them. They tell us that the dragon is called ora locally, and they talk about their habits and behaviors. They used to bring a goat with them to feed to the dragons on the river bank where the lizards gather, but this practice has been discontinued. You soon pass the sign that warns, "Dangerous area - watch out. 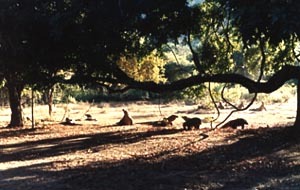 Komodo crossing. Be silent." The park service men tell us that silence is necessary not to avoid scaring the dragons, but to avoid attracting them. The dragons are large, ferocious predators that are fully capable of killing and eating a human being. The men recount several tales of dragons eating people. The most famous story is that of the German tourist who went to the beach alone to sunbathe. All that was found of him were his glasses and his camera. As we were walking along the path, a large dragon came along. The park men had us stand in a single row along the edge of the path and told us to stay still and quiet. We did this, and the dragon swung by us, eyeing us and flicking his tongue. After he had passed, we went on our way. The hike is fairly long and very hot. The destination is a river bank by a dry creek bed where the dragons like to gather to sun themselves in the morning. The park has constructed a fenced-in area for tourists to stand in while observing the dragons. This is like a zoo in reverse. The people are in the cage and the animals are on the outside. If you get there early enough, you will see lots of big dragons. They move about languidly, slowly, ambling around in a clumsy, shambling manner on their pillar-like legs. It's hard to believe, watching them, that they are capable of running as fast as a dog. The park service guys stay outside with the lizards, holding their big forked sticks and keeping an eye on everyone. Like other reptiles, the Komodo dragons detect chemical signals such as odor and taste with their long, forked tongues. The one below is checking out the delicious tourists on the other side of the fence. The giant lizards have powerful claws which they use to devastating effect in fights with other lizards. 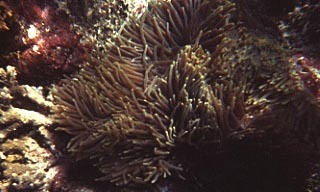 Males have scratching fights with each other during mating season. Once the sun gets high, the Komodo dragons head down the river bank to the dry stream bed below, to the left on the picture below. The dragons dig deep burrows where they get cool, and where they lay their eggs. Komodo dragons drool copiously, as shown below. Their saliva is not venomous, but the mouth of a Komodo dragon is so full of bacteria that a bite from one almost always leads to infection. If untreated, the infection is usually fatal. This is one way in which the dragons get food. They hide in the scraggly jungle and wait for a victim to pass by. The victim is most often a deer, carabao or goat. The dragon attacks the prey, and may succeed in killing it on the spot. Otherwise, the bites sustained by the victim will generally kill it eventually, and the dragons will then eat the carrion. You can find the excellent video, Wild Discovery: Dragons of Komodo, at Discovery Store. Komodo dragons are a kind of monitor lizard. Their scientific name is Varanus komodoensis. 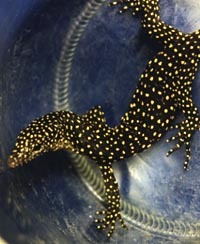 We have a monitor lizard on Guam that is a smaller relative. Whereas the Komodo dragon can reach a length of 3 meters (about 10 feet), our little one can only get to be a little more than one meter long at most. Below is a baby monitor lizard that we rescued from our cats. The local name for our lizard is hilitai. 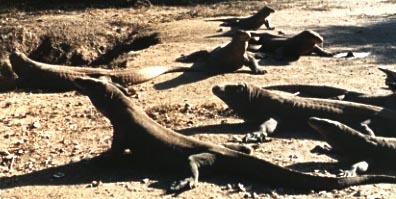 Komodo dragons are the largest kind of lizard still living on Earth, but they are not the largest reptile. Alligators and crocodiles get bigger than Komodo dragons. Alligators and crocodiles are also more closely related to dinosaurs than are Komodo dragons. Komodo dragons are excellent swimmers, and can swim from one island to another. The island of Komodo has many beautiful beaches where a visitor can play and swim, but the presence of Komodo dragon foot- and tail-prints in the sand warns the visitor to be cautious and watchful. Some of Komodo's beaches have beautiful pink sand, tinted by fragments of red coral mixed in with other shell and coral fragments. Other beaches have gray sand derived from cliffs of rhyolite. Heavy black sand composed of nearly pure magnetite accumulates next to the cliffs. 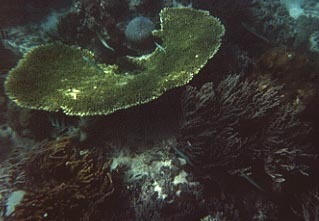 The snorkeling and diving around Komodo are some of the best in the world, especially for seeing soft corals. A professional diver told us, "You know, when you're a diver, you spend your life dreaming of and searching for the best dive site in the world. Well, Komodo is it." 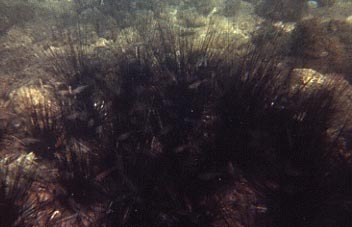 These photographs were taken with one of those disposable waterproof cameras, since we don't have any fancy equipment capable of underwater photography! 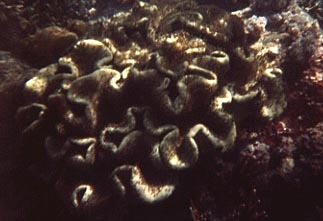 This is what we saw snorkeling close to shore. The water felt cold to us, unlike the bath-water temperatures of the ocean around Guam. Clusters of beautiful, long-spined black sea urchins are one of the many reasons why people should be careful where they put their feet on the reef! These creatures had beautiful iridescent orange and blue spots in amongst their spines. Altogether, Komodo is one of the most fascinating places on Earth. Read about Satonda Island: Home of the Fruit Bat! Read about the Critters of Guam! Check out Cuttlefish, the Sentient Cephalopod! Return to Heptune's Journal of Lore and Levity! See the comprehensive database of online Komodo dragon information at Komodo Dragons Central! Click hereto join the Reptile's Web World Web Ring. This Reptile Ring site is owned by Brenna Lorenz. Want to join the Reptile Ring? is owned by Brenna Lorenz. Want to join the Lizard Ring? Get the info! HOME The Lorenz-Pulte Home Page About us! Journal of Lore and Levity E-mail us!